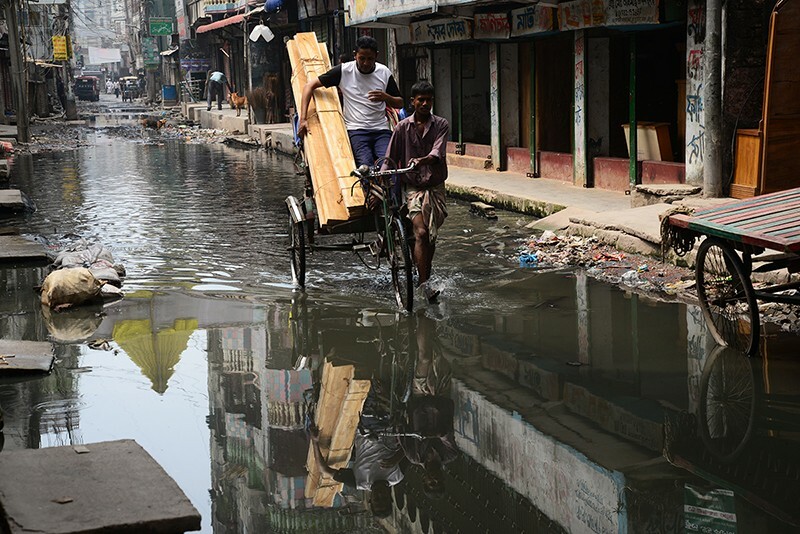 Nations such as Bangladesh and Egypt have long known that they will suffer more from climate change than will richer countries, but now researchers have devised a stark way to quantify the inequalities of future threats. A map of "equivalent impacts", revealed at the annual meeting of the European Geosciences Union (EGU) this month in Vienna, shows that global temperatures would have to rise by a whopping 3 °C before most people in wealthy nations would feel departures from familiar climate conditions equal to those that residents of poorer nations will suffer under moderate warming. The Paris climate agreement, adopted by 195 countries in 2015, aims to limit the rise in global mean temperature to 1.5–2 °C above pre-industrial levels. The world has already warmed by one degree or so — and since 1900, the mean number of record-dry and record-wet months each year has also increased. But the effects of global warming are uneven, and poor regions in the tropics and subtropics are thought to be most vulnerable, for several reasons. They have limited financial resources with which to prepare for shifts in temperature and precipitation, and they are expected to face bigger changes in climate than countries in the mid-latitudes. Researchers have had difficulty quantifying those inequalities because the impacts of climate change depend on many factors, such as future economic growth and technological progress, which are hard to forecast. Luke Harrington, a climate researcher at the University of Oxford, UK, took a different approach by developing the concept of ‘equivalent impacts’, which doesn’t specify societal consequences. Instead, it focuses on quantifying the uneven distribution of extreme weather around the globe. Harrington looked at changing patterns of extreme daily heat and rainfall in global climate projections based on fast-rising greenhouse-gas emissions. He then determined how much warming was required for a clear climate-change signal — such as extreme temperatures or precipitation — to emerge from the ‘noise’ of natural climate variability at each spot on the globe. The resulting maps show how quickly regional changes in weather extremes will manifest in response to different levels of global warming. For changes in regional heat extremes, the pattern is particularly stark. Africa, large parts of India and most of South America are likely to experience changes clearly attributable to climate warming early on, after a 1.5-degree increase in global temperatures. But mid-latitude regions — where most greenhouse gases are produced — won’t see such pronounced changes until the global temperature rise hits 3 degrees or so. “This is an elegant way to tie global climate targets and regional impacts,” says Erich Fischer, a climate scientist at the Swiss Federal Institute of Technology (ETH) Zurich, who was not involved in the study. But he says that the model would need to be adapted to include metrics of specific climate-change impacts, such as those on human health and food security, for it to be useful for planning adaptation efforts or for informing international climate-finance programmes. Some proposed schemes would compensate poor countries for climate-change-related harm. The equivalent-impacts index, says Fischer, could help quantify how climate change will affect different countries, because it focuses on identifying when they will start to face weather outside their natural variability.